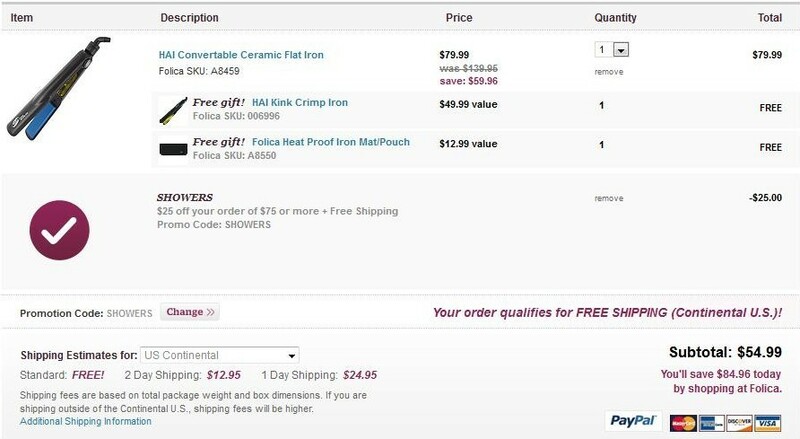 Free HAI Crimp Iron & Heat Proof Iron Mat/Pouch w/ Flat Iron Purchase + $25 Off + Free Shipping! This week at Folica, the HAI Convertable Ceramic Flat Iron is on sale for $79.99 (reg. $139.95). 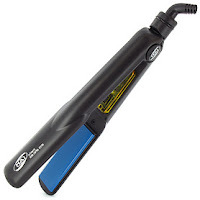 If you buy that, you'll get a FREE HAI Kink Crimp Iron, a $49.99 value and a free heat proof iron mat/pouch! Even better, you'll score free shipping for everything! Better yet, use the code SHOWERS at checkout to take $25 off your order!! The flat iron has lots of great reviews and has specially-coated ceramic heat panel that protect hair using infra-red heat. The crimp iron only has one review on the site, but it's a 5/5. 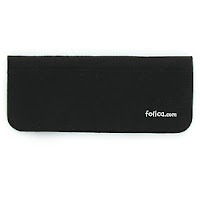 It has ceramic plates that help texturize, volumize and crimp hair. Just add the Flat Iron to your cart and your free gifts will automatically be added! So, you'll get $202.93 worth of products for only $54.99...not bad at all! Click here for more info and don't forget the code SHOWERS at checkout! NOTE: If you do not want to spend that much money, you can get $10 off your first Folica purchase by clicking here to get a $10 off promo code to use at checkout!